MANCHESTER - The Manchester Elks Lodge and community groups from around the state honored hundreds of veterans and their families - including a 101-year-old resident of New Britain - Thursday at a pre-Pearl Harbor Day event. This was the third annual Holiday Veterans Gathering, hosted by the Manchester Elks, and this year’s theme was the 100th anniversary of women being allowed to join the Marine Corps. “You are the spirit of this country,” Tony Duarte, exalted ruler of the Manchester Elks, told the veterans. Gerry Gallo, chairman of the Manchester Elks Veterans Committee, said additions have been made to the gathering each year, including special honorees and new themes. In addition to a warm meal, veterans left the event with an assortment of personal care items and winter clothing like insulated vests, hats, gloves and socks. Employee volunteers from Johnson Brunetti Retirement & Investment Specialists, which cohosted the event, served food to veterans and their families. “Of all the things we do every year, this event is the one that all of our staff ask about. The folks involved today - it’s not something they’re required to do, it’s something they asked to do,” said Eric Hogarth, a partner at Johnson Brunetti. Several notable special guests were honored, including Julia Lempeck, a 101-year-old World War II veteran from New Britain. 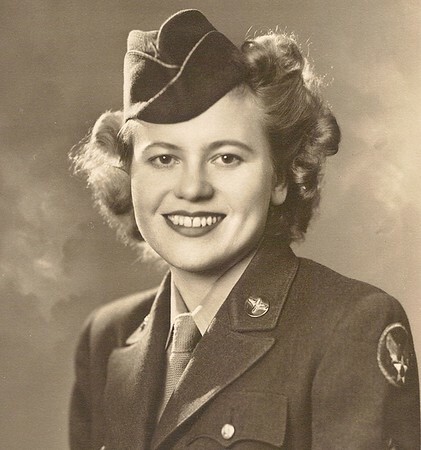 In 1944, at the age of 26, Julia Gonas, as she was then known, entered the Women’s Army Corps and served stateside as a clerk typist with the 244th AAF Base Unit. The Starford, Pa., native was honorably discharged in July 1946, earning the American Service Medal, World War II Victory Medal and Good Conduct Medal. Julia and her husband, Theodore Lempeck, a fellow World War II veteran who died in 2012, married after the war and relocated to New Britain. 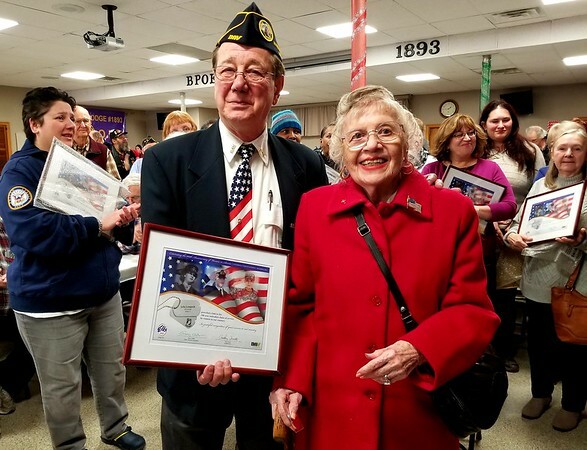 Lempeck was accompanied Thursday by New Britain’s own Dennis Taricani, Disabled American Veterans Chapter 8 commander, and Dennis Buden, executive director of House of Heroes Connecticut. “She has such an energy to her. Her patriotism is inspiring,” Buden said. Lempeck’s daughter, Eileen Keefer, said her parents have always been eager to contribute to the country’s wellbeing. Despite her age, Lempeck still sings along when the national anthem and other patriotic songs are played. “She went into the Pledge [of Allegiance] spontaneously when they recited it earlier,” Keefer said. Earlier this year, HOHCT honored Lempeck by doing yard work and repairs on her property. A groupe of volunteers replaced the flag and flagpole in her yard, and also presented her with an encased American flag she can keep in her home. “It’s still flying,” Lempeck said of the flag in her yard. Posted in New Britain Herald, New Britain on Thursday, 6 December 2018 21:17. Updated: Thursday, 6 December 2018 21:19.